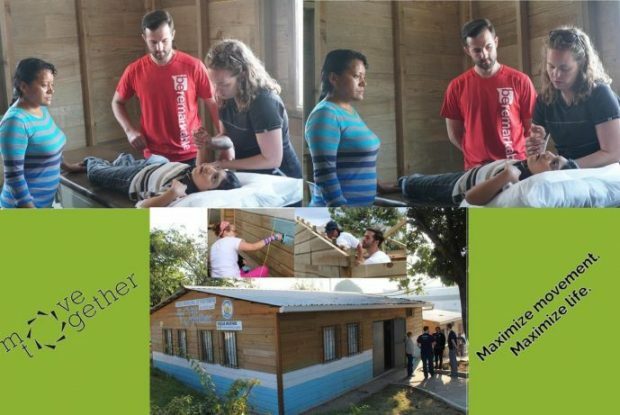 In May 2017, Oscar and his mother, Thelma, came to the newly constructed Jairo Rodríguez Municipal Physiotherapy Clinic in Mercado Concepción, Villa Nueva, Guatemala. Thelma brought Oscar to the clinic in hopes to increase his movement and voluntary engagement with her and his environment. Oscar was wheelchair bound, highly non-verbal, and restricted in voluntary and big movements. Oscar had traumatic brain damage due to a placental abruption before birth. Oscar from the beginning was restricted in movements. Movements we often take for granted like pushing oneself up in the chair, rolling over in bed, holding a cup or utensil, and other voluntary actions. Thelma spends a lot of her time caring for Oscar and helping him roll over, sit in the chair, and eat. 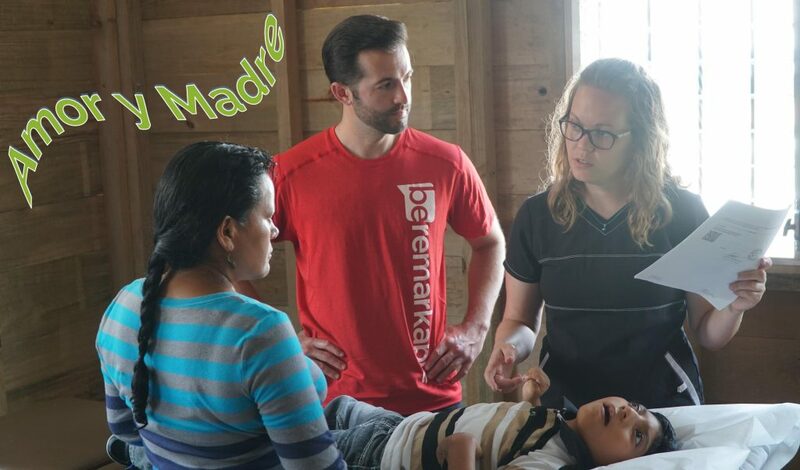 At the clinic, the physical therapy (PT) team, two physical therapists and a Spanish/English translator, paused to listen and understand the depths of Oscar and Thelma’s story. They captured the history of Oscar’s journey to this point, heard the desires of a mother’s heart, assessed Oscar’s physical state, and learned how he was cared for today. The team performed a passive assessment of the joints and muscles throughout the body recognizing the great muscle tonicity within Oscar. Muscle tonicity is a neurological impairment that when trying to move a joint the muscle tightens or muscle tone kicks in, and you are unable to move them anymore. This is not a conscious reflex but an unconscious reflex in this situation. Therefore, the team went a little deeper to see how they might treat Oscar and lessen the muscle tonicity. A question to answer: what, if any, action and speaking occurs with Oscar. His mother shared that Oscar speaks two words, amor and madre, love and mother. The room paused the tears flowed as in that moment a realization of the depths of a mother and son’s love was felt. Next, they learned that he rarely makes any voluntary action of reach, except an occasional reach for his mother’s hand. The bond of a mother and a child is precious. Even when for many, things may seem hopeless. It is in these simple words and gestures that connections bring hope and love, even in challenging times. They also discovered that Oscar relaxes and moves most when Reggaeton music is played. Reggaeton music style comes from hip-hop and Latin American and Caribbean music. With this knowledge, the team now educated Thelma on how to engage Oscar in more movement, in ways to stretch him minimizing contractures, and on ways to transfer and care for him reducing strain on herself. Since Reggaeton music relaxed Oscar, his mother was encouraged to play music, especially during stretching to help minimize the muscle tone and rigidity in movement. This allowed passive movement and the ability to stretch and elongate the muscles that shrink and shorten when wheelchair bound. By the second session, they both presented noticeable improvement. Thelma’s transfer techniques had improved, and less strain placed on her back. She had a better understanding of how to effectively stretch, and the playing of Reggaeton music relaxed the muscles and minimized the muscle tone kicking in. Education, practice, and treatment options had not been fully explored. Therefore, Oscar and his mom continue to visit the newly established physiotherapy clinic to advance Oscar’s care, protect Thelma’s health and movement, and empower her with knowledge on the vitals of care and ways to improve their quality of life. Therapy has advanced beyond physiotherapy in the clinic to occupational therapy, therapeutic gymnastics, and increased engagement at home. She is very dedicated to her son’s care and eager to learn and participate in activities to maximize his life and the entire family’s life. She thanks God for her son and prays that he one day will be independent. She is thus motivated to push through the challenges of life believing in the opportunities ahead even in the smallest advancements. The story does not stop there but provides another dimension of not only increasing access to quality rehabilitation medicine but advancing movement that betters the community through the development of community within the clinic. The community within the clinic expands throughout the entire clinic and beyond. During Oscar’s 2nd treatment session, his mom asked Ali, a treating PT, “when are you leaving?” The Move Together family present from the US was departing the next day; therefore, today was the last day in the clinic. Thelma saddened though not discouraged asked if we would still be around in the afternoon. With an affirmative response, they left for home to return some time later with 26 handmade thank you cards, one for each of the US Move Together family members present that day. 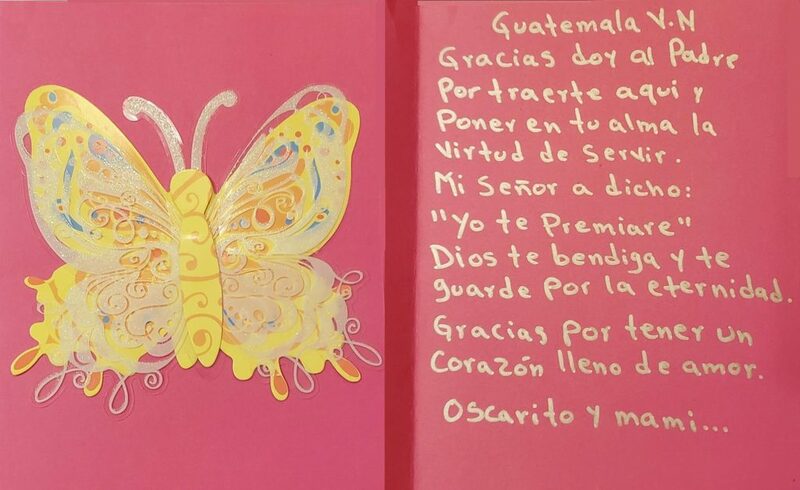 The cards hand decorated with pictures and stickers on the outside and inside a handwritten note of thanks and gratitude for the servant hearts present. This is the essence of community forming within the clinic and the mutual, bidirectional accompaniment of people. The PT team embraced the present moment before them to hear, to understand, and to share their knowledge and abilities with Oscar and his mom. In return, Oscar and Thelma were receptive to listen and learn how to maximize movement in both of their lives to reduce further injury and bring about positive movement. This is one of many examples of how the increase to healthy ways of movement maximizes life and brings hope to people, families, and communities around the world. Patients and family members are filled with smiles and gratitude for the hearts of physical therapists and community leaders as they experience the labor of love.